Singing along: John Singh (second from left), founder of non-profit Jaipur Virasat Foundation, with folk musicians in Jodhpur. Jodhpur: In better times, Doda Khan recalls he flew to Italy with a group of musicians for Rajiv and Sonia Gandhi’s wedding. “Indira Gandhi gave me this," the 75-year-old folk musician from Rajasthan’s Barmer district says with pride, pointing to his carefully preserved white kurta, embroidered with flowers along the edges. “It was so beautiful." Besides playing at grand events, his music once graced the background of All India Radio. But as recently as a few years ago, his fortunes plummeted. He had trouble making ends meet, playing a handful of weddings per month for a few hundred rupees each. “It’s maybe enough to eat, but not any more than that," he says. “For us, there are no jobs and not many opportunities. We can only sing and perform." Today, he has been able to rebuild his house and can now put aside time to take about 20 students—free of charge— thanks to a pension from the non-profit Jaipur Virasat Foundation. The foundation provides half-a-dozen ageing folk musicians Rs2,000-3,000 per month in their old age, according to founder John Singh. In recent years, when the group was doing some relief work after the floods in Rajasthan, members noticed “top-notch artists who were languishing". “We thought, how can we let them die in this kind of way or spend their last few years fighting to exist. It’s as much about self-respect as it is about livelihood," says Singh, who also founded Anokhi, the clothing and furnishings company often credited with reviving Rajasthan’s block-printing industry. “With Anokhi, we managed to do that. The craft is not only alive today but it hasn’t been debased." 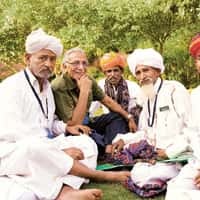 The pension programme, which Singh funds personally and through donations from friends, is one of the ways the foundation is trying to keep folk music alive in Rajasthan. As it supports the elderly, it also wants Indian youth to see music as a viable career option and provide opportunities to perform. The Jaipur Virasat Foundation and the Mehrangarh Museum Trust staged the Rajasthan International Folk Festival last week at Mehrangarh Fort, bringing folk artists from around the state together with their counterparts who play classical music, as well international folk, rock and hip-hop performers. The festival, which aims to boost tourism and Rajasthani folk music around the world, also attracted leading music critics and magazines, including some who discovered major international acts. A recording studio has recently been developed in Jaipur, a top sound engineer brought in and many of the folk artists are being recorded for the first time, said Singh. Though the project is preliminary, it could one day lead to albums and compilations of the music with a view toward marketing the traditional musicians internationally. “We won’t rule out that this could one day be something like a Buena Vista Social Club," says Singh, referring to a 1997 documentary that highlighted Havana’s largely unknown traditional Cuban musicians and spawned a soundtrack that some credit with sparking a craze for Latin American music in the US and Europe. In 2003, Rolling Stone named it among the top 500 albums of all time. They aren’t quite at that point with documenting the Rajasthani folk musicians, but hope to reach there in about two years, he said. But the international audience won’t keep the music alive. To that end, Singh says, his real concentration is on programmes like the pensions—which allow legendary artists such as Khan to teach the next generation—and running village-level festivals with an eye toward popularizing the music among the kids there. “If this lives, it will live in the village," he says.“Kids will only take this up and go into it if they see their father getting some respect. We need to end the days where they come in through the back door, perform for people while they eat matar paneer and then slip out through the back door."